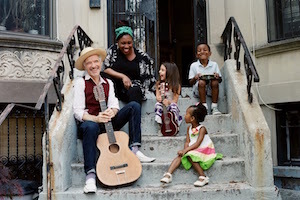 Multi-instrumentalist Dan Zanes and Haitian-American jazz vocalist Claudia Eliaza will bring their educational and interactive children’s show to Pepperdine University’s Smothers Theatre in Malibu on Sunday, January 27, at 2 PM. Grammy Award-winner Zanes occupies a unique place in American music. For the past 15 years, he has toured the world with his band, Dan Zanes and Friends, sharing handmade 21st century social music with enthusiastic crowds of kids and kid sympathizers. From thrift shop basements to Carnegie Hall, from Brooklyn to Bahrain, Zanes has been introducing new songs and reconnecting people to the forgotten music of the past. His critically-acclaimed music has been featured on Sesame Street, Playhouse Disney, Nickelodeon, HBO Family and Sprout. He has collaborated with everyone from Philip Glass to Lou Reed to Angelique Kidjo to Natalie Merchant to The Blind Boys of Alabama. Born in Exeter, New Hampshire in 1961, Zanes was a member of The Del Fuegos, who released quite a few albums and toured heavily throughout the 1980s before spontaneously combusting in 1989. In 1994 he released his first solo album, Cool Down Time. Shortly after, he moved with his family to Brooklyn. In 2000 he released Rocket Ship Beach, which became an immediate hit in the family music scene in America. He has since released 14 CDs, two DVDs, and a pair of picture books, all for young audiences. In 2017 Zanes also released an album which celebrates the children’s music of his childhood inspiration Lead Belly—an artist he considers to be the Godfather of modern family music. Lead Belly, Baby! is available on the Smithsonian/Folkways label and features performances by Aloe Blacc, Billy Bragg, Valerie June, and Chuck D.
Zanes is currently touring with his wife Eliaza in support of Lead Belly, Baby!, and their shows are highly interactive—the audience is always invited to sing and dance along. Zanes and Eliaza believe that sensory friendly is the future of family entertainment and have committed to presenting all of their various performances in this inclusive manner. Zanes also joined the ranks of America’s premier roots musicians as a guitar and ukulele teacher with Sonic Junction, the leader in online instructional videos and he recently signed a deal with Quarto Publishing Group to compile a family music songbook. Eliaza is an exuberant Haitian American songstress with a rich voice that captivates her audience at large. Having performed at the world-famous Carnegie Hall, Eliaza continues to perform in other prestigious venues such as the Jazz Philharmonic Hall in St. Petersburg Russia, and the Berklee Performance Center. Eliaza has sung and worked with legendary artists including Barbara Morrison, Nancy King, and Keith Lockhart. With outstanding success, she has also toured within the US, England, Germany, Australia, New Zealand, Ashdod, Israel, Kenya, Africa, and all throughout Russia. Her passion for music reaches beyond her performance life. Eliaza is a Board-Certified Music Therapist in the Boston area where she directs the Music Therapy Program at Community Music Center of Boston. She believes that music has the power to break down walls and build bridges while fostering meaningful connections across generations. Prior to the performance, the Center for the Arts will host Family Art Day in the Gregg G. Juarez Palm Courtyard from noon to 2 PM. The event will feature special art projects and Weisman Museum tours, and is free and open to the public. Ticket prices range between $10 and $15, and are required for attendance. For additional information about the events, visit the Center for the Arts website.